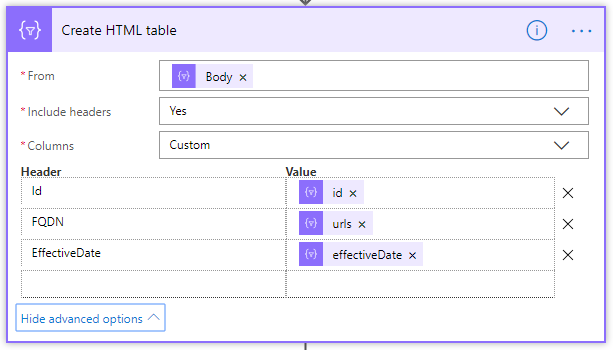 Click the Add column button, then add Latest (Single line of text), Endpoints (Multiple lines of text), and Previous (Single line of text). The Id must now be made visible. To do this, select All Items at the top right and select Edit current view. Check the box next to the Id field and select OK.
Add a seed item to allow the Flow to make it's initial comparison. Add the title as Worldwide and add the Latest as 0000000000. There is no need to populate the other fields. Now save this and you're ready to create the flow that references this list. No we will create the Flow and call it something like O365 Endpoints. Here is a glimpse of the completed Flow. We will now use a blank template so choose Create from Blank. As this Flow will be automated, the trigger we will choose will be a Recurrence trigger, so search for and choose Recurrence. Configure the schedule to run once a day and set a time when you'd like it to run. I prefer 9am. 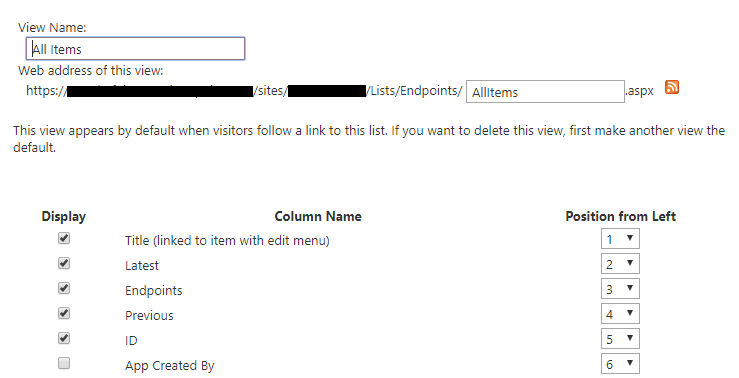 Now add Get Items command from the SharePoint category. You will notice I have accessed a Site page and then chosen the list that was created above. So, for our next command we want to use HTTP so will choose New Step and search for HTTP. N.B. I have used NoIPV6. If you want IPV6 Endpoints or just want to work with the full list within Flow then be sure to remove NoIPV6& from all URIs. 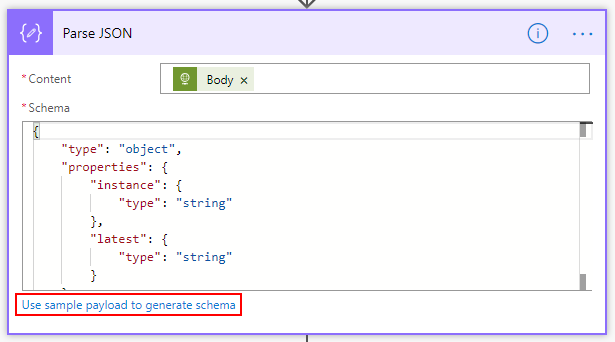 Now to build the schema by clicking Use sample payload to generate schema. 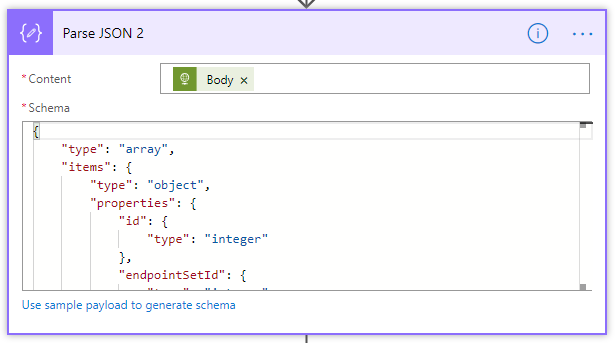 Now click Use sample payload to generate the schema and paste it in then press Done. Congratulations, you have just returned a web service using Flow and done something with it's output. 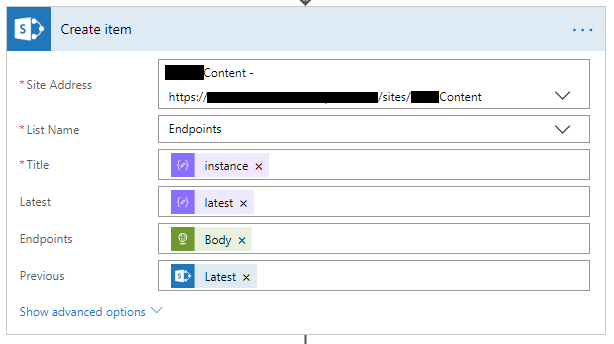 Now, in order to establish if anything has changed and if there may be new endpoints, we will compare the latest version with all of the SharePoint items. We will do this by using the Apply to Each action. Within the Apply to Each will add a condition, more on that shortly. 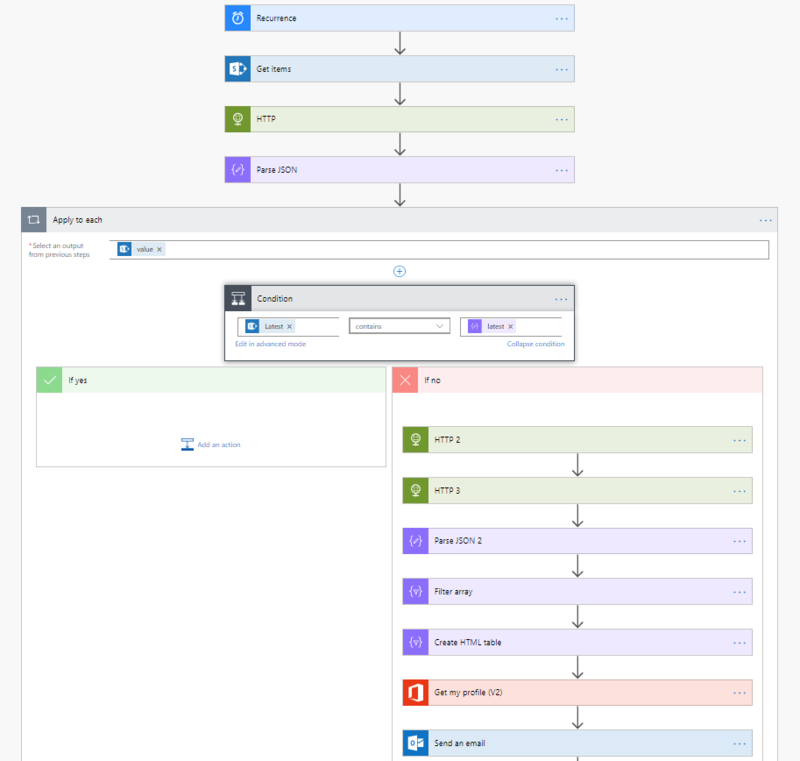 So, with the above Apply to Each we are going to loop through all SharePoint items and compare the latest version. It will return true if it matches the latest version and the flow will complete as a success. But if it returns false, this indicates Microsoft has released new endpoints and we will no take steps to fetch them and do more with the data. In the No section of the condition we will now add an other HTTP 2 action as below. And now we will parse the response of HTTP 3 in order to get just the changes since the last update, usually 1 month ago. Now it's time to build the schema. Like before, we will go to the URI we are parsing, capture the JSON and click Use sample payload to generate schema. Paste it in then click Done. 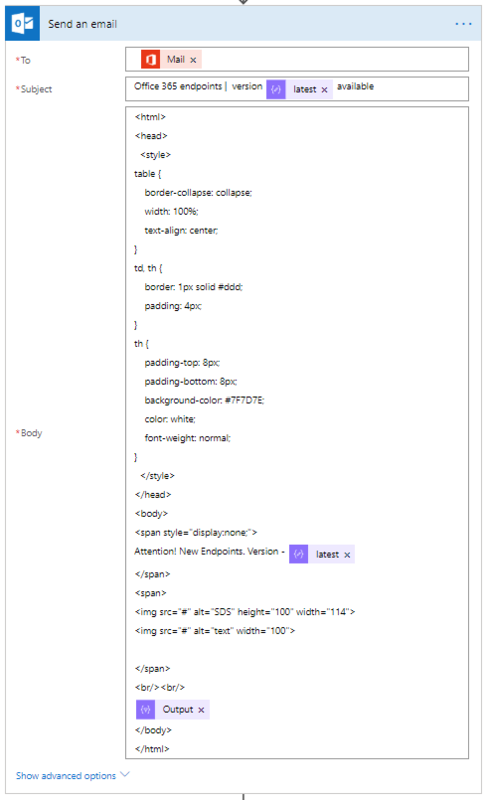 The Parse JSON has built the schema for us. Now we filter the response as in this example, we are looking to access just the new add urls, nothing more. Then choose some columns and table data, FQDN being the information required and the others for dressing of sorts. Then pre-populate and send an email. And to tidy things up, let's update the SharePoint list. On to the final step. Testing this is pretty easy. 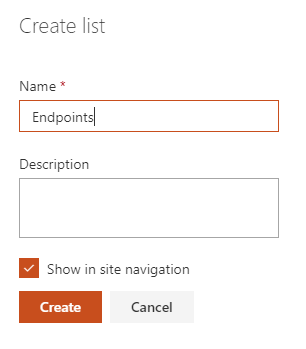 If your endpoints in the SharePoint list are on the latest version and you want a real life simulation of new endpoints being published, just change the latest version value to an older version. The key to this Flow running and calling new endpoints is the comparison to the latest version. 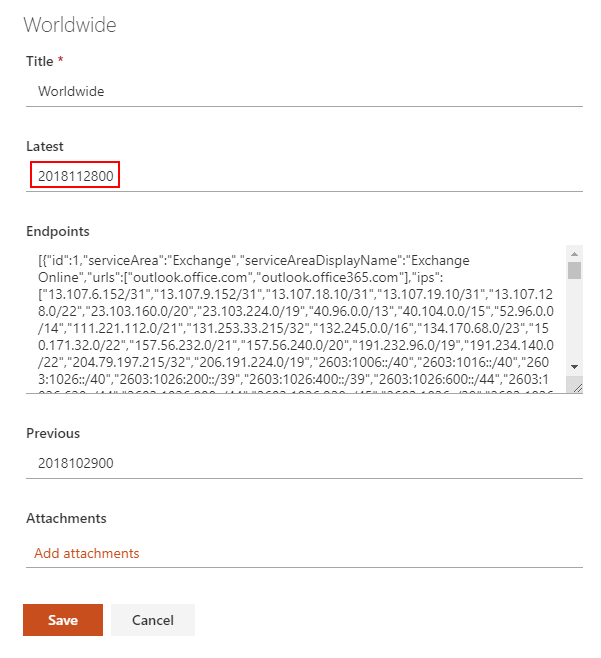 If within SharePoint the 10 digit value for the latest version is out of date the Flow will go on to carry out the HTTP requests as described above. So there we have it. Admittedly, I would like the output to email just a little more concise and just each FQDN on its each line without the noise around it. I am working on that at present and plan to post a revision if I can pull it off. If maybe you manage to enhance the output to email, I'd love to see that. Be sure to let myself and the community know.